The Chester County ACEs Coalition: Good News Chester County! Did you miss our radio debut? Don't fret - you can catch it here! WCHE radio channel Good News Chester County is devoted to broadcasting good news about the organizations and people who are making a difference in our Chester County community – helping to make our community a better place to live, work, and raise a family! 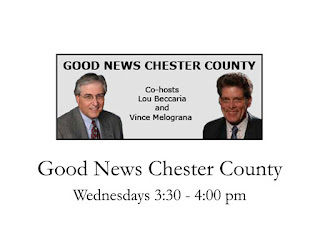 Tune into channel 1520AM to hear co-hosts, Lou Beccaria and Vince Melograna bring good news in and around Chester County to WCHE radio Wednesdays at 3:30PM.